Asheville Middle School, Asheville, N.C. The new roof features 90,000 square feet of 0.060 TPO from Firestone Building Products. Roofing Contractor: Benton Roofing Inc., Flat Rock, N.C. 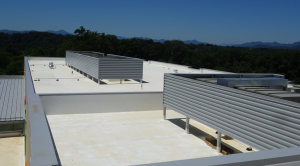 The new construction roofing project commenced in Fall 2015 and was completed in June 2016. The new middle school is adjacent to the existing middle school, which will be removed when the new school opens in Fall 2016. The project features solar hot-water heating.